The second book in the Blank Slate series, DAMAGED GOODS, has finally been released into the world. Today, I’m chatting with the author of that YA Dystopian series. I’m insistent with my kids that we don’t have technology out while we’re having a family dinner, but it seems like texts, notifications and other things distract us from each other at every other time. What gave you the idea to have cell phones cause brain tumors and be seen as a “big evil” by The Vestal founder? I’m addicted to my smartphone as much as the next person. In fact, I’m probably more addicted because I’m on social media so much. Turning off my phone and paying attention to the people in front of me is something I struggle with, but I try hard to be a good role model for my kids. They aren’t old enough for iPhones yet, but when they are, I don’t want them to copy bad habits. The idea about phones and brain cancer came to me when a friend was describing what it was like visiting her old sorority house at college. At my college, everyone had normal dorm rooms, but at her sorority house, there was a sleeping room. One person was in charge of waking everyone up at the allotted time, that way there wasn’t a gazillion alarm clocks going off all morning. My friend was shocked when she visited because nowadays, instead of a person on duty waking people up, all the girls just slept with their cellphones right on their pillow with silent alarms. She wondered if that was safe, having Bluetooth, etc. right next to their brain matter. That’s what gave me the idea for GENESIS GIRL and the cancer epidemic. I find the billboard advertising in the series somewhat ironic. In a totally tech society, shouldn’t advertising in that way be extinct? In my imagination, they were more like digital billboards, with changing screens. In real life advertising infiltrates our lives at every possible moment. There’s Disney Princesses on my daughter’s chicken noodle soup! But in the future, who knows how advertising will evolve? It will be exciting to see. Of course, Blanca’s attraction to the billboards is also interesting. I always loved reading them when we traveled by car. They seemed more “honest” than TV commercials to me, but why would I think that? (rhetorical question) And why does Blanca see being exposed there as acceptable while online media revelations are dirty and evil? Blanca’s okay with the billboards because they are approved advertisements from the companies the Vestals represent. She wants complete control of how her image will be shared. So if McNeal solar shares a picture of her, Blanca is excited. But if a total stranger snaps a shot of her standing at a bus stop, Blanca would freak out. It’s kind of like how some people never want their friends to share pictures of them online unless their hair and makeup is perfect. A major theme in the new book is trust. It’s interesting that Blanca keeps big secrets and doesn’t trust the right people but doesn’t see those things as a lack of trust or even a problem. What are you hoping your teenage readers take from this? Knowing who to trust is one of those hard lessons everyone must learn on the path to adulthood. Don’t be the first person to fall asleep at a slumber party, for example. But for Blanca, trust is exceptionally challenging since she grew up in a controlling environment where she was brainwashed. My hope is that teen readers take inspiration from Blanca’s commitment to survive, think for herself, and follow her instincts. Thanks so much for writing such “page turners” and for taking time out to stop by my blog. And now for a totally “fun” question. If you could have a super power, what would it be? Why would you choose it? Thank you for having me! I would love to be able to fly—or make dog poop disappear. Either one! Check out my FOUR STAR review of the book on Goodreads. Read more about DAMAGED GOODS and don’t forget to enter the giveaway. The first novel in this series, GENESIS GIRL, released in 2016 and is about an 18 year-old girl whose lack of a virtual footprint makes her so valuable that she is auctioned off to the highest bidder. Jennifer is represented by Liza Fleissig of the Liza Royce Literary Agency LLC. See the rest of the tour schedule here. I’m a fantasy author. I’m a fantasy author. *dances around the desk singing* Read my debut story in Masked Hearts today. Join the fun on the blog tour for the next two weeks. There are reviews and interviews and chances to win prizes. I know you don’t want to miss any of that. I’m excited to introduce the world to my beautiful woodland elf, Alyona Wyrden, who travels to the earthen realm (you know, where we humans live) in search of her missing brother. I hope you’ll fall in love with the amazing magical artifact detective, Agent Camden Kerr. His job is to protect humans from dangerous magically charged items. Items like the amulet Alyona is using to travel between realms and track her brother’s location. Will he get the artifact? Will she find her brother? What sort of choices will they make between “Duty and Desire”? Not to hog the stage in my excitement over my own story, here are the blurbs for the other four fantasy romances. Brooke Adair’s autism has turned the world into a constant puzzle, especially when it comes to men. When she meets fellow swan shifter Blake Landen in a dream, though, Brooke feels a potential connection to someone who could understand her. If she lets him. Join the rest of the tour stops. Read reviews and excerpts. Click on the button. Happy Book Birthday to Soul of Dust and Adam Millard! Adam Millard is the author of twenty novels, ten novellas, and more than a hundred short stories, which can be found in various collections and anthologies. Probably best known for his post-apocalyptic fiction, Adam also writes fantasy/horror for children. He created the character Peter Crombie, Teenage Zombie just so he had something decent to read to his son at bedtime. Adam also writes Bizarro fiction for several publishers, who enjoy his tales of flesh-eating clown-beetles and rabies-infected derrieres so much that they keep printing them. His “Dead” series has recently been the filling in a Stephen King/Bram Stoker sandwich on Amazon’s bestsellers chart. Adam writes and edits for UK horror website This Is Horror, whose columnists include BC Furtney, Simon Bestwick and Simon Marshall-Jones. Adam lives with his beautiful wife, Zoe-Ray, and their wonderful son, Phoenix Justice. There are also chickens, rabbits and cats, but the less said about that the better. 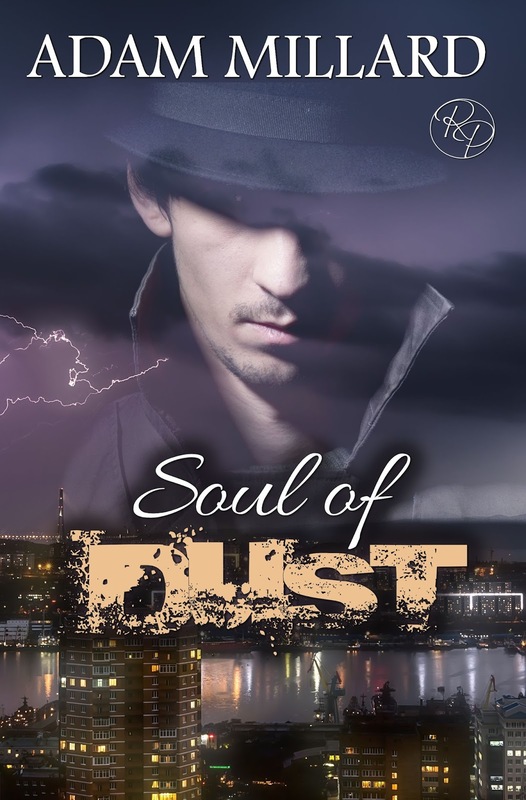 A paperback copy of Soul of Dust and a $10 Amazon Gift Card! 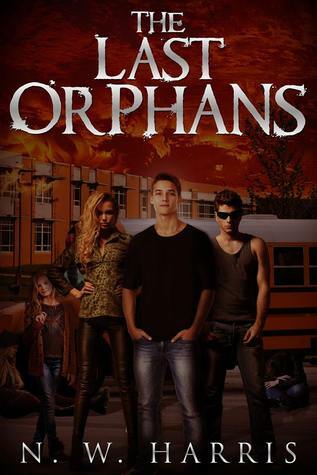 The Last Orphans is a Young Adult science fiction book with dystopian themes. This isn’t the first book by N.W. Harris I’ve read, which might be a recommendation of its own. I won this book from the publisher when it was first released in October 2014. It’s been sitting in my Kindle queue for many months. Why? Before I won the book, I interacted with the author, discovering the story has some graphic scenes of violence against the adults. Later, kids take up arms and are shooting each other. All of these are disturbing images, and the horror aspects of this story kept me away. After all, I had plenty of other reading choices. What changed my mind? The second book in the series came out in April and so the title popped back into my news feed. I decided if I just read the book in the mornings while running on the treadmill, I shouldn’t run too serious of a risk of netting myself any nightmares. Shane and his dad aren’t getting along. Shane has lost his mom and grandmother, and in the midst of this grief, strange events begin to happen. He gets the unfortunate experience of being present when an adult he cares about meets the crazed assassins of nature. While he’s holding out hope that he can save this person, he meets up with his secret crush and her sister, only to learn the rampaging cattle he noticed earlier stampeded their parents. An tortuous vehicle ride later, watching another adult meet their end and discovering too many bodies to count, these three reach the high school gym where a bunch of other kids are gathered. When they travel on toward Georgia’s capital, things get worse. At the military base, they discover the soldiers have survived but are now turning on each other. A radio transmission explains the cause of all the strange events (government project gone wrong) and gives these teens an objective. In the end, they manage to stop the craziness, but the body count is high. This book earned four stars from me in my Amazon and Goodreads reviews. The story was well-constructed and moved along at a steady pace. By the mid-point, I found myself reading it on my lunch break as well as the treadmill. I wanted to find out how they would survive. You will too. Most of the characters didn’t move or interest me. I was particularly disappointed in Shane. Not that he didn’t have courage, skills and a good heart. He just wasn’t the best choice of leader. The author didn’t convince me that Shane should lead, so it felt contrived that the other kids wouldn’t choose someone more popular as their leader. The horror aspect of the story is real – and revolting. The more critical issues of teen-on-teen crime was handled with finesse. Even though we hate to see kids hurting each other, their motivations are realistic and well-drawn. The crimes aren’t glorified or exaggerated. Harris showed himself a skilled writer in his handling of these events. After the ever-increasing pace of the narrative, the ending rushed in and tied things up too neatly. It truly felt like a set-up for the sequel. If you’ve read many of my reviews, you know how I feel about that. If you enjoyed the Gone series by Michael Grant, you should read this book. Even though the plots are dissimilar in many ways, many of the themes are the same. The biggest question: how would young people survive if all of the adults suddenly disappeared? I caution parents and younger readers about the graphic content in this book. Being covered in cockroaches is horrifying to imagine. If the cockroaches have the intention to kill? It’s worse. Nightmarish. If you have a vivid imagination – like me – I would recommend reading the book during the middle of the day. Book Sale! Get your books this month! All of Roane Publishing’s paperback titles are 25% off over at CreateSpace for the entire month of May! Click on the covers below for more information. Stock up all month long and enjoy! Offer good until May 31st at 11:59 p.m.
It’s here! The day I’ve been anticipating for many years. I am a published author. You can order my book at Amazon, CreateSpace or at my publisher’s website. I hope you’ll join the festivities and check out the different blog posts on the tour over the next two weeks. You can find my review of the stories I didn’t write in the anthology here. Buy the collection now by clicking here. Click here to check out a Rafflecopter giveaway and win your copy! Fantasy novels entice me. As you know, I’ve learned that novels of epic scope aren’t really my cup of coffee. Novels with an epic premise or story? That would be Eye of the Soul by Terri Rochenski. I was introduced to the writing of Rochenski through an anthology I bought to support one of my writer friends. You can check it out here. Since that time, I’ve been following the publisher, J. Taylor Publishing, on Facebook. When they posted that the first book in a series would be FREE to celebrate the release of the second book in the series, you know what happened. I clicked the link. Amazon offered its wonderful “Buy now with 1-click” option and another book added itself to the ever-expanding queue. Not every book in that queue will be read by me. Several I snagged for FREE weren’t worth the price I paid for them. Not so with Eye of the Soul. Led by her faith in the deity Fadir, Hyla is met along her journey by Jadon—a human male and fierce King’s warrior, and his childhood best friend Conlin—one of the few Natives aware of his Fadir-given Talents. Protected by Jadon, guided by Conlin, and with an unfailing belief in the purpose of her pilgrimage, Hyla carries on. The novel opens with the capture of Natives by an ambitious High Priest. The Natives appear as elves in my mind – fair skin, pointed ears, (supposed) mystical abilities. I liked that Rochenski uses a different name for them, leaving her plenty of space to conform them to the story she’s telling. Hyla, a nineteen-year-old orphan, is away collecting roots and herbs for the healers when the attack comes. Right away, we see she is fearful, which makes the reader wonder why. That backstory is sprinkled in at all the right moments. Through a number of narrators, the story unfolds. A High Priest with a vendetta against the deity of the Natives emerges as the villain. We want to hate him; his despicable misuse of power and authority begs it. Yet, we see he has a secret past – a motivation not unlike that of Mr. Freeze (of Batman fame). Jadon and Conlin enter the story as childhood friends who share the spotlight as the male heroes in the story. They are like night and day, but their camaraderie and realistic interactions pull the reader further in to this fictional realm. Hyla’s Talent (mystical power) is the only one that isn’t dormant as the story opens. And she resents it because it shows her the true intentions behind every word and deed. It’s a curse, and she doesn’t understand why the king and others want to use it. How can it help win a war? In a dream, she is called to the Pool of Souls. When the High Priest discovers its location, he sends his own combined group of soldiers and gifted (but unawakened – so he believes) Natives. Conflict unfolds and the course is clear. Who will make it to the Pool? What does the Pool actually do? Will Hyla accept her calling? And, will she choose Conlin or Jadon? The characters are well-formed and realistic. Although the motivations of some of them are unclear or questionable, most of them acted and reacted consistently. Intrigue surrounds the powers of a few “non-Native” people in the story: where did their powers come from? Why do humans have these “gifts”? The problem is straight-forward and the plot un-convoluted. We know the goals of the characters and, except where they are keeping a secret, we understand what motivates them. This is by no means a simple story, it is just easy to follow. Rather than shrouding information, the author shares it – to the end that it creates more questions and adds tension. This story gets a solid 4.5 out of 5 stars from me. It took me awhile to decide I liked Hyla – needed to understand what made her so mistrustful. Although Jadon is likeable, he seems rather stereotypical. If it weren’t for his friendship and interaction with Conlin, I might have written him off as an egotistical, womanizing jerk. Give these characters the chance to grow on you, and you won’t be disappointed. Nothing about the story line or premise (racial discrimination, anti-religion and revolutionary tendencies) disappoints. This is the first book in a series. I’m delighted to meet these characters again. I’m also thrilled that Rochenski handled the story in the proper way: one problem for this book is tackled and resolved, while the larger series problem is clear but still hangs overhead at the end of the book. The epilogue introduces a new twist and creates immediate anxiety because it pushes one of the heroes into the line of fire. This is a great way to encourage readers to put down book one with the left hand and pick up book two with the right. It was added to my Amazon wish list with a single click, and you’ll see it on my Goodreads “TBR” list, as well. If you like magic, sword fighting and quests, this is a book you’ll want to read. Whether you’re looking for a great story or a deep story, Eye of the Soul grants your wish.